“‘I have never pretended to be a boxer. I don’t possess those skills,’ Stallone continued. ‘But what I do think I have is an understanding of what goes on outside the ring. Outside the ring is sometimes maybe an even bigger struggle than what goes on inside the ring. 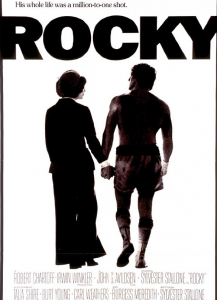 If I was able to capture that, I believe (moviegoers) could identify more with (Rocky). Mike Tyson, Julio Cesar Chavez, Kostya Tszyu, Ignacio “Nacho” Beristain, and Joe Cortez were also inducted into the Boxing Hall of Fame. Chavez lived as a youth in an abandoned railroad car. Chavez took harder hits outside the ring than he ever did as a boxer but he kept moving forward, enduring the price to make that difference. A friend of mine back in college at Michigan State got in the Rocky spirit and decided to fight in the Golden Gloves. According to Hollywood, this was going to be his Rocky moment. While other students went to parties, he trained in the boxing gym. He was knocked out in the first round of his first fight. Then he got up and went on to much bigger things outside the ring. It’s a lesson I will carry with me for the rest of my life. It’s the Rocky Rule of life- get up and keep moving forward. What boxing teaches more than any other sport is respect for the God of Opposition. Somewhere out there is a fist, a bullet, a pink slip, something bad that you must contend with, and overcome. You won’t see it coming, but it’s still there. A friend’s father boxed in Golden Gloves in Kentucky, and his opponent was a guy named Cassius Clay who later changed his name to Muhammad Ali. “Never saw his hands” is how his fight was described. The first time you go in the ring and hear and feel the “whoosh” go past your ear, you’ll put your gloves up a little higher against the God of Opposition. Drawing a Golden Gloves opponent like Ali is another life lesson from the sport of boxing, which is that no matter how bad a fight you may be in, there’s always someone else in a tougher battle. 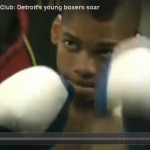 The Detroit News has an article about the Downtown Boxing Gym teaching kids about how to go pro on life.